Colorado Peak Politics | OBAMACARE: Judge Declares it Unconstitutional, Now What? 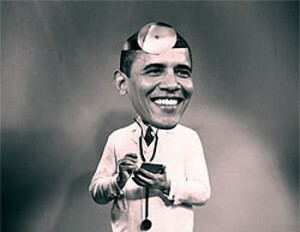 OBAMACARE: Judge Declares it Unconstitutional, Now What? A federal judge in Texas last week shot a bullet straight into the heart of Obamacare and declared it unconstitutional. If only it would die. Alas, the ruling won’t actually change anything next year, or the year after that. The usual liberal suspects led by California plan to challenge the ruling, which could take years. If you’re asking yourself whether you need to go ahead and buy a mostly useless health insurance policy on the open market before the Jan. 12 deadline, that is now totally up to you. Republicans cancelled the outrageous tax penalty imposed by Obamacare on those who refused to buy, or could not afford, health insurance. That takes effect in January. The policies are mostly worthless anyway, with expensive premiums, plus huge deductions that must be met every year before the insurer decides to actually help pay for your health costs — pre-existing conditions get no special privileges. Health insurance isn’t much different than car insurance since Obamacare came along. Just like your car insurance won’t cover oil changes, flat tires, dead batteries, electrical malfunctions, windshield wipers, or any other automotive care, health insurance doesn’t actually cover most health care costs. They might throw in a couple of bucks now and then on some prescriptions, pay a percentage of your doctor visit if you can find a doctor that actually accepts these policies, but other than that, it only comes in handy if you need a major operation that would otherwise bankrupt you. Only eight percent of Coloradans buy insurance on the open market, and our uninsured rate is less than seven percent. Not everyone needs health insurance at some points in their life, and since Obamacare has nearly destroyed the free market and drove up the cost of numerous procedures and medications not covered by insurance policies, we would expect to see that number of uninsured Coloradans rise.